Artichokes – The Rose Beneath the Thorns – Life of the Party Always! This week I must have a thing for the odd looking vegetables because the artichoke is another one that is a strange one for many people. If you know how to make it, you will be converted to an artichoke lover for life! Once you remove the thorns and trim the leaves, it looks like a rose bud! Eating an artichoke is a bit of ritual and a healthy treat combined. You run your lower teeth over the leaves of the artichoke to capture the sweet, meaty flesh at the base that is so full of Iron and wonderful flavor. It’s an odd experience at first but sometimes the least expected things bring the most pleasure! For Medium to Jumbo size Artichokes, start by washing the Artichoke under cold, running water to remove any bugs or dirt in the leaves. Trim the end of the stem so that the artichoke sits flat. Remember the stem is an extension of the Artichoke Heart and is edible so steam the stem along with the rest of the artichoke. Great nibbles! Trim the top of the Artichoke by cutting off 1/4 of the top (about an inch) and discard. Use kitchen scissors to trim off the top of each Artichoke petal by about an inch. This will remove the sharp thorn and make a beautiful presentation, like a rose. 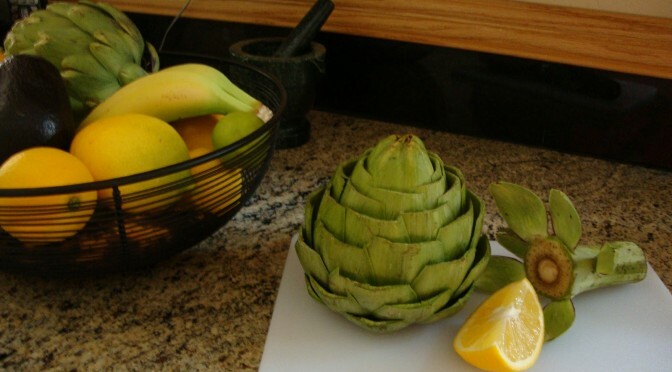 To preserve the color, immediately rub any cut surface of the Artichoke with lemon juice to prevent browning caused by oxidation. Steaming an Artichoke is the ideal cooking method for maintaining the high-nutrient content for which an Artichoke is known. Arrange Artichokes in a steamer insert, basket, or a special Artichoke holder in a pot deep enough to keep Artichokes above water. 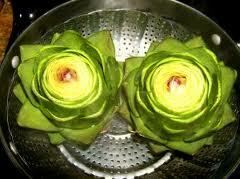 Cover and steam over rapid-boiling water making sure to maintain the water level, until Artichokes are tender. Depending on size and quantity of Artichokes, steaming time can range from 30 to 50 minutes; lift out carefully and drain. Boiling Artichokes was the traditional way of cooking Artichokes. 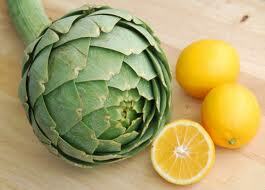 However, boiling extracts the healthy nutrients from the Artichoke when compared to any other cooking methods. They also tend to retain some of the water and can be soggy. Should you choose to use this method, place Artichokes in a full pot of boiling water and boil for 25 to 40 minutes, depending on size and quantity of Artichokes being cooked. To test that the artichoke is done, stab a fork into the stem end and if it goes in easily, the artichoke is done. My personal favorite! Grilling adds color and a delicious smoked flavor to Artichokes. But Artichokes need to be pre-cooked before grilling. To pre-cook Artichokes, steam or boil them. 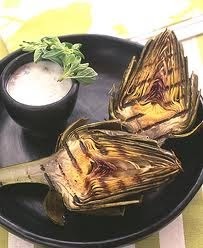 Cut Artichokes in half before grilling and remove the furry choke with a teaspoon. Place the artichoke halves cut side up and marinate them. Marinate for at least one hour. Left over marinade can be used for dipping sauce too if you want a little extra of this fabulous flavor. Place cut side down on the grill and grill until lightly charred and turn to grill the other side. Make sure that the outer side has some olive oil on it before you flip it. By marinating and grilling you will have more of that grilled taste throughout the Artichoke petals and you don’t need a dipping sauce! Artichokes are great for cooking the day before and reheating when ready to serve. For this “time-saving step,” prepare and cook Artichokes the night before. Warm up in microwave or conventional oven as you would with any vegetable to preferred temperature. 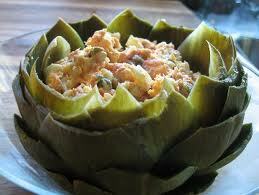 Artichokes are also great served cold so don’t think you need to reheat them before serving. A fun way to serve them is to remove the furry choke center and stuff with a chilled seafood salad.